More than a decade ago I wrote The OmegaRx Zone, subtitled “The Miracle of High-Dose Fish Oil.” A recent article in the New York Times entitled “Fish oil claims not supported by the research” comes to the opposite conclusion(1). Obviously, one of us is right, and the other is wrong. Omega-3 fatty acids only have therapeutic potential when used at therapeutic doses. This is no different from any prescription drug. If you use placebo doses of either, you get placebo effects. However, omega-3 fatty acids are far more complex than any drug because they work at several different levels from acting as molecular building blocks to powerful hormones that control inflammation to altering the expression of inflammatory genes. Every leading academic researcher in cardiovascular disease knows that heart disease is an inflammatory disease. But what part of inflammation actually causes heart disease? This is a more complex question since there are two distinct phases of inflammation. The first is the initiation of inflammation. The second is the resolution of inflammation. They are both active processes and operate independently. If they are mismatched, the result is continuing low-level chronic inflammation below the perception of pain. I term this mismatch of the two distinct phases of inflammation as cellular inflammation. It is cellular inflammation that actually causes the build-up of atherosclerotic lesions and their rupture that leads to the mortality from heart disease. At low levels of omega-3 fatty acids (1-2 grams per day), they are weak inhibitors of the initiation of inflammation. To have any real impact on the initiation of inflammation, you need much higher levels (greater than 5 grams per day). This was published 25 years ago in The New England Journal of Medicine(2). There is virtually no long-term cardiovascular study that has ever used more than 5 grams of omega-3 fatty acids on a daily basis. However, the real power of omega-3 fatty acids comes from their ability to accelerate the resolution phase of inflammation(3). This requires considerably higher levels of omega-3 fatty acids (8-10 grams per day). It is only at these higher intakes of omega-3 fatty acids that a powerful group of pro-resolution hormones (i.e. resolvins) can be generated at therapeutic levels to cause the resolution of inflammation. Furthermore, it is not just the dietary intake of omega-3 fatty acids that is important, but also the ratio of the omega-6 fatty acid arachidonic acid (AA) to the omega-3 fatty acid eicosapentaenoic acid (EPA) since that ratio determines the balance of initiation to resolution in the body. Unless you get that AA/EPA ratio to be under 3, and ideally about 1.5, there will never be enough resolvin formation to eliminate chronic cellular inflammation. In essence, the higher your AA/EPA ratio, the more inflamed you are. 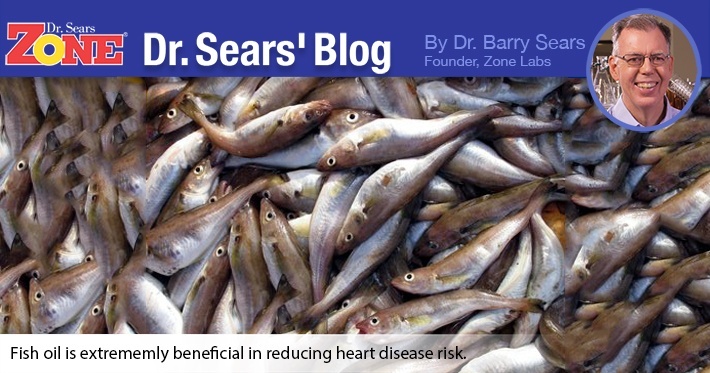 This explains why many of cardiovascular trials with omega-3 fatty acids have provided equivocal results. The only anti-inflammatory drug that has any benefit in secondary prevention of heart disease (i.e. preventing a second heart attack) is aspirin (4). Why aspirin and not other anti-inflammatory drugs? It turns out that aspirin at low levels causes a chemical change in certain enzymes that can alter the chemical structure of the resolvins to extend their lifetime in the blood and thus enhance their resolution of inflammation(5). However, at higher dose levels of aspirin, all of its resolvin-enhancing benefits are lost. In fact, at higher levels aspirin as well as other anti-inflammatory drugs become anti-resolution drugs. This means they inhibit the necessary steps to start the resolution process. This is why anti-inflammatory drugs have significant side effects, especially for increasing the risk of a heart attack(6). A little research by the New York Times would have been useful before publishing the article. One article that should have been quoted was an international study that looked at Japanese males versus American males to try to explain the dramatic differences in their rates of heart disease mortality(7). A summary of the data presented in that article is shown below. The greater than 3-fold increase in age-adjusted CHD mortality rates in Americans compared to the Japanese is unlikely due to differences in the cholesterol (total or LDL) levels between the two populations. Likewise, the 6-fold greater number of Japanese males who smoke compared to American males is also unlikely to explain the lower CHD morality rates of the Japanese. However, there seems to be a very good correlation with the lower AA/EPA ratio in the Japanese and it relationship to the lower CHD mortality rates in the Japanese compared to Americans. What about Japanese with high cholesterol levels? That question was answered in the JELIS study with more than 18,000 patients(8). This is one of the largest cardiovascular intervention trials in history. It was a little different than most clinical studies because all 18,000 patients got statins. In essence, statins were the placebo. The active drug was a supplement of EPA. Half of these cardiovascular patients were given extra EPA (1.6 grams per day) as a dietary supplement and the other half received an equivalent amount of olive oil as a supplement. The starting AA/EPA ratio in both groups was 1.6, so compared to average American, they had very low levels of cellular inflammation. After more than 3 years of supplementation with omega-3 fatty acids, those getting the extra EPA had their AA/EPA ratio lowered to 0.8, whereas getting the olive oil remained at 1.6. Yet that reduction of 50% in their AA/EPA ratio resulted in a 20% greater reduction in cardiovascular events compared to those getting the olive oil. This would suggest that prescribing statins without adequate levels of omega-3 fatty acids at the same time to lower to AA/EPA ratio is simply practicing bad medicine. Maybe the Japanese are very genetically different than Americans. So let’s see what Harvard Medical School has to say on the subject of the omega-3 fatty acids in the blood and incidence of CHD in Americans(9). The average AA/EPA ratio of the Americans in this study was about 18, which is far greater than the average Japanese (between 1.5 and 3), but in line with long-scale studies on Americans(10). Yet those Americans in the Harvard study who had the highest quartile of EPA in their blood (a measly 1.6% of total fatty acids) had a 51% lower incidence of heart disease compared to the quartile with the least amount of EPA (0.6% of total fatty acids). To get American EPA levels up to those found in the Japanese (2.5% of total fatty acids) would require eating far greater amounts of fish or taking very large levels of fish oil supplements. This was demonstrated in a study with women at high risk of breast cancer(11). The women in this study could only achieve the same AA/EPA ratio as in Japanese cardiovascular patients by taking in 5 to 7.5 grams of EPA and DHA per day as dietary supplements. So why might the earlier fish oil supplementation studies be more suggestive of the benefits of fish oil supplementation than more recent ones? One potential reason is that statins were not in wide usage at the time of these earlier studies. Statins are the only drug known to increase AA production, and thus will increase the AA/EPA ratio(12). This would increase the risk of CHD. Hence the increasing use of statins may have eliminated all the benefits of omega-3 fatty acid supplementation. Another potential reason is that the levels of PCBs found in most fish oil capsules (especially if you are taking 2 to 3 capsules per day) would be high enough to increase the incidence of heart disease and therefore obliterate any benefits of purified supplemental omega-3 fatty acids(13). A final reason might be the increasing intake of omega-6 fatty acids worldwide will cause decrease in the body’s natural production of omega-3 fatty acids(14). This makes it more difficult to reach the necessary omega-3 fatty acid levels to generate adequate levels of resolvins. This would account for the increased incidence of heart disease in studies using omega-6 supplementation alone in cardiovascular patients in absence of providing additional omega-3 fatty acids at the same time(15). Bottom line, I would have expected the New York Times to do a little more investigative reporting on fish oil supplementation and heart disease before simply rewriting press releases. Whatever happened to the good old days of investigative journalism? O’Connor A. “Fish oil claims not supported by research.” New York Times. March 30, 2015. Endres S et al. “The effect of dietary supplementation with n-3 polyunsaturated acids on synthesis of interleukin-1 and tumor necrosis factor by mononuclear cells.” New Engl J Med 320:265-271 (1989). Serhan CN. “Pro-resolving lipid mediators are leads for resolution physiology.” 510:92-101 (2014). De Caterina R and Renda G. “Clinical use of aspirin in ischemic heart disease: past, present and future.” Curr Pharm Des 18:5215-5223 (2012). Serhan CN et al. “Resolvins, docosatrienes, and neuroprotectins, novel omega-3-derived mediators, and their endogenous aspirin-triggered epimers.” Lipids 39:1125-1132 (2004). Gottlieb S. “COX 2 inhibitors may increase risk of heart attack.” BMJ 323:471 (2001). Sekikawa et al. “Serum levels of marine-derived n-3 fatty acids in Icelanders, Japanese, Koreans, and Americans.” Prostaglandins Leukot Essent Fatty Acids 87:11-16 (2012). Yokoyama M et al. “Effects of eicosapentaenoic acid on major coronary events in hypercholesterolaemic patients (JELIS): a randomized open-label, blinded endpoint analysis.” Lancet 369:1090-1098 (2007). Otto MC et al. “Circulating and dietary omega-3 and omega-6 polyunsaturated fatty acids and the incidence of CVD in the multi-ethnic study of atherosclerosis.” J Am Heart Assoc 2:e000506 (2013). Harris WS et al. “Erythrocyte omega-3 fatty acids increase and linoleic acid decreases with age: observations from 160,000 patients." Prostaglandins Leukot Essent Fatty Acids 88:257-63 (2013). Yee LD et al. “Omega-3 fatty acid supplements in women at high risk of breast cancer have dose-dependent effects on breast adipose tissue fatty acid composition.” Am J Clin Nutr 91:1185-1194 (2010). Rise P et al. “Statins enhance arachidonic acid synthesis in hypercholesterolemic patients.” Nutr Metab Cardiovasc Dis 11:88-94 (2001). Bergkvist C et al. “Dietary exposure to polychlorinated biphenyls and risk of myocardial infarction.” Int J Cardio 183:242-248 (2015). Taha AY et al. “Dietary omega-6 fatty acid lowering increases bioavailability of omega-3 polyunsaturated fatty acids in human plasma lipid pools.” Prostaglandins Leukot Essent Fatty Acids 90:151-157 (2014). Ramsden CE et al. “Use of dietary linoleic acid for secondary prevention of coronary heart disease and death: evaluation of recovered data from the Sydney Diet Heart Study and updated meta-analysis.” BMJ 346:e8707 (2013).